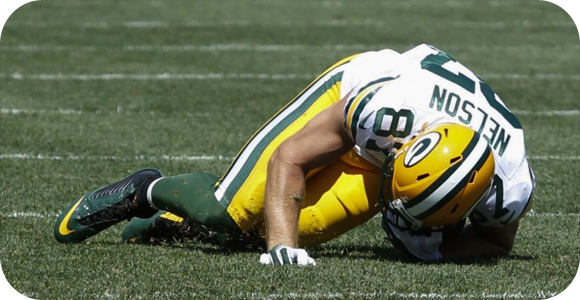 Jordy Nelson’s injury has caused some trouble for the Packers, not only on the field, but also at sportsbooks that target US bettors. Most of you football fans have probably already heard of the terrible injuries that occurred during the second week of the NFL preseason. This has greatly affected several teams for this 2015 regular season, especially the Green Bay Packers. It is not every day that a top NFL team loses one of their key players, and to make matters worse, it happened during the preseason. The Packers had great odds of reaching the Super Bowl, more specifically, they were tied with the Seattle Seahawks with odds of 9/2; however, after the injury the Packers were bumped down to 6/1. They were also dropped from 9/4 down to 3/1 odds of winning the NFC championship this year. Unless the team can somehow fill that giant hole left by Nelson on the offense, it looks like Aaron Rodgers will have to throw much more accurately to their regular wide receivers. This may be the chance a player from second team has been waiting for, and they may perform outstanding. This is all thanks to the fact that during a preseason game, where the points don’t matter, the Packers lost one of their most valuable players on the field. Jordy Nelson is one of their top wide receivers, who in 2013 had 1,314 receiving yards, and in 2014 had 1,519 receiving yards; all adding up to a total of 21 touchdowns. He was a key part of the offense, with highest paid QB Aaron Rodgers ready to pass the ball to him, but he now has a torn ACL, which will most likely prevent him from playing in games during the rest of the season. This news hit the US facing sportsbooks hard, as they make most of their money from American sports. However, this did not really affect most of the off-shore books. For example, as Michael Stewart of CarbonSports told Covers, “While this is a big blow to the Packers, they are still co-favorites to win the Super Bowl and NFC with the Seahawks at +650 and +320 respectively.” So you can expect to find most of the betting lines and odds unchanged, while at others they will have changed drastically to fit the new profile of the Green Bay Packers as they will start the regular season without Jordy Nelson.